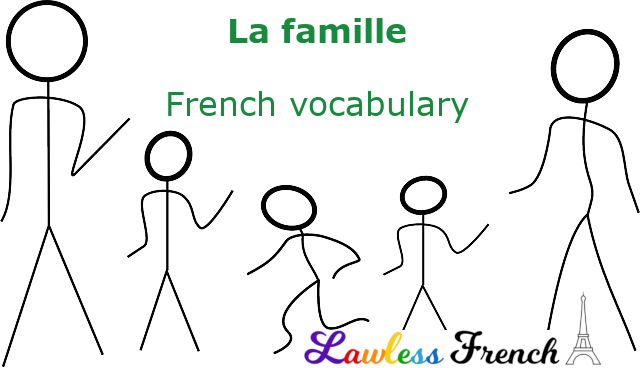 One of the interesting things about la famille and French family vocabulary is that the word parent means not just "parent" as in mother or father, but also "relative." It can be both a noun and an adjective. J’ai un parent à Lille. I have a relative in Lille. Nous sommes parents par mon père. We’re related on my father’s side. For twins, triplets, etc., see the "multiple births" section of Multiplicative numbers. In French, there’s no distinction between step-family and family-in-law: they are both equivalent to beau- or belle- plus that family member. in Greek there is word “cinco” for your opposite in law (of either gender) I don’t suppose French has such a word? No, I’ve never heard of a word like that. Is there a word for extended family such as “the relatives” in English, or is “la famille” used equally for immediate family and distant relatives that you may have not seen for many years? If there is only the one word, it would seem that additional clarification must generally be provided, in both discussion and written correspondence, in order to provide context and avoid confusion. 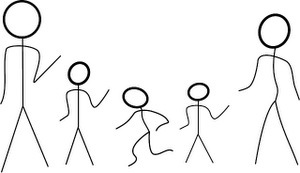 Yes, there’s la famille étendue – I’ve added it. Merci !